Google has been handed a record €4.3 billion by the European Commission, with the bureaucrats claiming the search giant abused the dominant position of Android to bully consumers into using its search engine. The European Commission, hereafter known as the Gaggle of Red-tapers, has given Google 90 days to end the activities, or face non-compliance payments of up to 5% of the average daily worldwide turnover of Alphabet, Google’s parent company. Google has been bundling its search engine and Chrome apps into the operating system, with the Gaggle also claiming it blocked manufacturers from creating devices that run forked versions of Android, and also making payments to manufacturers and telcos to ensure exclusivity on devices. “Today, mobile internet makes up more than half of global internet traffic,” said Chief Competition Gaggler, Commissioner Margrethe Vestager. “It has changed the lives of millions of Europeans. Google will of course appeal the fine, and will likely use its own legal might to tie the Gaggle up in more red-tape than the boresome bureaucrats ever thought possible, but this is a notable decision. 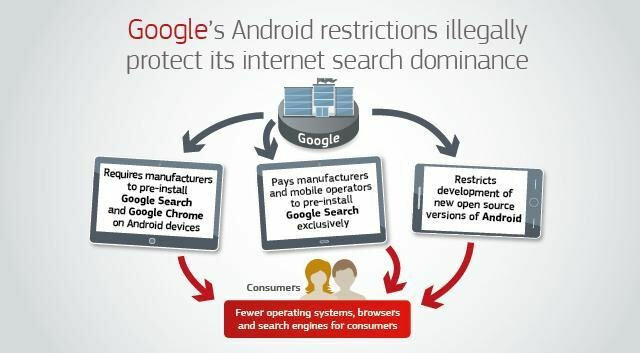 Not only has the European Commission come to the conclusion Android has a dominant position in the European market, some 80% of smartphone run on the OS, but it has determined Google actively sought to inhibit competition, and therefore negatively impact the experience and choice of the consumer. One of the conclusions Google has found issue with is the competition between Android and Apple’s iOS. The Gaggle has decided the two are not competing with each other, due to the fact Apple devices are not tailored towards the low-end of the market, therefore Android maintains a monopoly over poorer demographics and regions. The Gaggle also notes there is a ‘cost’ to switching to iOS, including loss of data, contacts, and having to learn how to use a new OS, which counts against the search giant. Google disagrees with this point, even quoting the Gaggle’s own research that suggests 89% of respondents believe the two OS’ compete. Another important aspect to note is the openness of Android. This is an additional bugbear of the Gaggle, pointing towards the limited opensource nature of the OS as a negative, though Google contends this point. Should Android be make more open to developers and users, the fragmentation in the ecosystem could be boggling. Google argue it needs to maintain control to ensure consistency and experience. This argument is less clear cut, as there are positives and negative outcomes on both sides. Overall, this is of course not a new argument. The European Commission found fault with Microsoft bundling Internet Explorer with its Window OS in years gone, while Google has constantly been under the microscope in Belgium. The Gaggle does not seem comfortable with the idea of relaying revenues to other aspects of the ecosystem, a business model which is becoming more common in the digital era. For a service to be free, there has to be a value exchange. As it stands, device manufacturers get an Android licence for free under the condition Google products are set as default. Google spends an unknown amount every year to ensure Android is the best OS on the market, and monetizes the experience through its search engine. Should it be proven Google is operating illegally, the practise should be adjusted, but we would argue there would be detrimental impact to the consumer should it be stopped completely. The only other alternative is to charge the device manufacturers for the right to use Android. We suspect this will never happen, but we have no doubt this expense would be passed onto the consumer, who will probably end up using Google anyway as the search engine is arguably the best on the market. The payments to manufacturers and telcos is not the most above-board business we’ve ever come across, and perhaps preventing the development of Forks is suspect, though this point is much more nuanced; Google is rightly claiming fragmentation of the OS and applications would impact experience. That said, we don’t have too much of an issue with the conditional bundling of other services with the Play Store and Android OS; Google has to make money after all; it doesn’t offer software as a charity. The outcome of this saga is unlikely to be known for months. Google’s lawyers will do everything possible to complicate the situation, lobbyists will be charged and the PR machine will start cranking, but there is the potential to have a very fundamental impact on the industry. Will Google bow to demands and lose its grip on search? Could it start charging a license fee Android? Or might it just say screw everyone else and keep Android exclusively for its own Pixel devices in Apple-esque style?